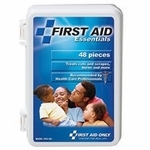 Select from various sizes of First Aid Kits for home, office or travel. 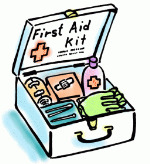 Regardless of where you go, you should always have a first aid kit close by to be prepared for any emergency and disaster survival situation. Our kits come in various sizes from personal to large groups and sturdy cases are designed to protect the kit contents. Our First Aid Kits include most commonly needed bandages, alcohol prep pads, ointments, disposable gloves, scissors and more (see content listings for details).